Congratulations to Suzy Garcia, Southern Division Director and May Chen Martin-Kuo. Southern Division is now OFFICIALLY President’s Distinguished! Congratulations to Suzy and her team! Area 21 is now Distinguished. Distinguished Area Director Catie Somers will soon to be President’s Distinguished Area Director with the new club chartered in Sempra last Tuesday and the Hill Talker club adding 3 members to become Distinguished. 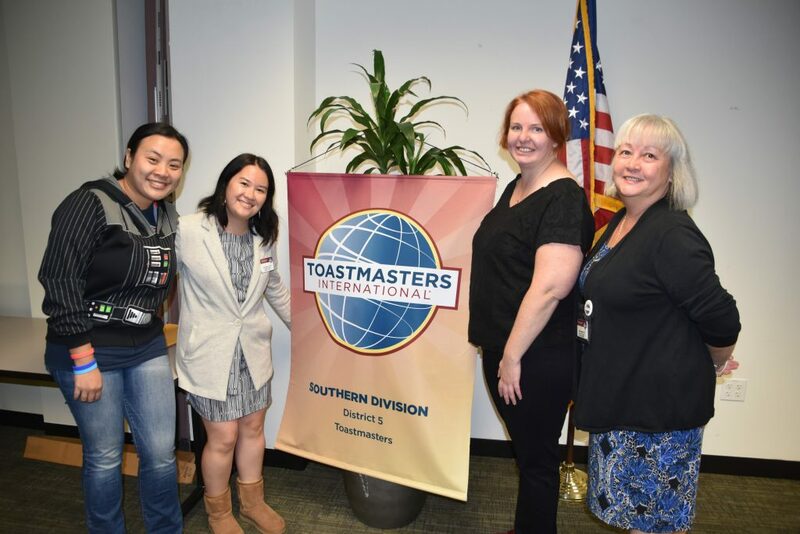 Southern Division team – Ron, Rick, Nadeen, Jane, Tony, Catie, and Suzy will continue working towards the goal making every Area in Southern Division to be President’s Distinguished! Yes, it’s Official – District 5 is now Distinguished! You can claim the title Distinguished DIstrict Officer! We encourage you to set your goal to be President’s Distinguished Area Director, but whether you meet that goal or not, everything you do counts. For example, Brandt and Marissa worked together to charter a new club, their areas are not Distinguished yet, but it brings Inland Division back to its base, and brings the District to Distinguished! We still have 20 days. Roll up your sleeves to help each other. We can make it! In addition to Western Division, another team demonstrate outstanding teamwork is Southern Division.